Listen to Sportstalk live on Sundays at 6:00 p.m. This franchise has a storied past. It’s a tremendous group of guys and gals that always gives 110 percent and knows that team chemistry is important because there’s no “I” in team. But, clichés aside, the Ithaca College Sports Radio staff has made a name for itself through its award-winning coverage of most Bombers sports—and a growing list of successful alumni. Every year, the staff of about 30 students covers at least six sports teams, from football in the fall to baseball and softball in the spring. In all, the staff produces over 60 broadcasts annually between the college’s radio station, WICB, and its sister Internet station, 106-VIC. Running the staff this semester are WICB sports director Evan Heidenrich ’08 and 106-VIC sports director Mike Berger ’07. Together, they oversee the staff ’s weekly work, which includes seven daily sports updates on both stations, game broadcasts, and weekly sports talk shows. For the members of the staff, the hours may be long and responsibilities plenty, but the rewards are worth it. Berger’s story is a little different. He spent two years at George Washington University in Washington, D.C., where he was also sports director before transferring to Ithaca. He was surprised to find that Ithaca’s sports broadcasting staff takes their job as seriously—if not more so—than the staff at GW. 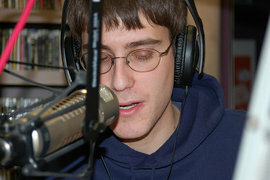 With a growing collection of successful alumni, the staff has been getting more attention from the broadcasting world. Currently, the staff has graduates working throughout minor league baseball, Division I college sports and even at big time stations such as WEEI in Boston.